Now that you’ve had a chance to wrap your mind around the concept of needing to make end of life decisions, let’s discuss some specific mechanisms by which you can ensure your wishes are honored. Living Will: This document, also known as medical directives, addresses those scenarios where you are unable to communicate your near death choices. The key consideration is that a living will keeps the power and decision-making in your hands, even when you’re incapacitated or otherwise unable to state your preference. You’ll want to have a copy of this form with you or with your family. Do Not Resuscitate (DNR): A DNR form takes the living will consideration straight to the end of life question and explicitly states your preference not to receive cardiopulmonary resuscitation (CPR) and advanced cardiac life support (ACLS) if needed. Your physician will retain a copy of this document in your medical record as a way of alerting other medical providers (such as in the emergency room–if and when you show up there) of your desire. 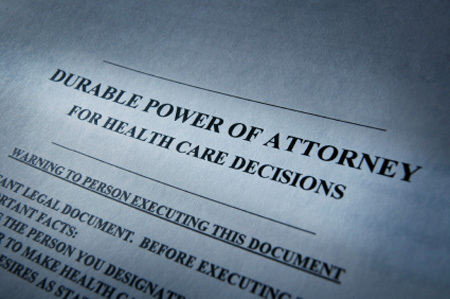 Healthcare Power of Attorney (POA): The healthcare POA is your designee to carry out your medical wishes beyond what you have explicitly stated. A healthcare POA may serve more than one function. If you haven’t made DNR or living will type decisions, a POA will make those decisions for you. If you’ve made some decision and not others, the POA will fill in the gaps. Making a POA designation is literally putting your life in someone else’s hands. Be very careful who you choose for this role. Some people will simply designate next-of-kin or a family member. Others will want someone objective with no other motives (e.g., financial) than fulfilling their wishes. Either choice is much better than no choice, which too often leaves family members with competing interests and potentially having to carry the burden of making decisions for you that you could have made in advance. Your POA will not be able to overturn decisions you’ve designated on the DNR form or your living will. Your POA will not be able to make any decisions for you while you’re still able to do so unless you ask him/her to do so. It’s important to know that you can simultaneously have a living will, DNR declaration and a Healthcare POA. If you’re able, it may be wise to engage an attorney to sort through the various documents. I hope for your sake and the comfort of any family you may leave behind that you take the time to engage in end-of-life planning for yourself and others in your family. I’ve seen all too often how messy it gets when issues aren’t addressed in advance. You really don’t want that happening to you at the end of your life.